Are you not able to access or see your folder options under File Menu>>Tools in Windows Explorer on your Windows XP ? This problem of hidden or disabled folder options occur normally due to malicious virus (w32.rontokbro@mm) activity. 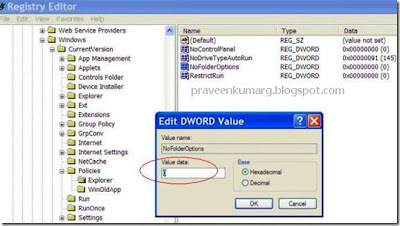 The virus creates an entry in registry to disable “Folder Options” in Windows explorer. In most of the cases, even if the virus is been already removed by your anti-virus program, it doesn’t restore the registry back to the original state. Also anti-virus usually does not delete the registry entry created by the virus. *Enable your folder options in explorer. 4. On the right side of the screen, you can see some registry entry names, out of them, right-click on NoFolderOptions and click Modify option. 5.A new small screen pops up, on this screen, sen the value data field as 0 (zero).Press OK.
That’s it but it requires reboot. Trouble Fixed. You can also make the Registry File using notepad Double Click on it,Trouble is Fixed. Note:Change in Save as type to All Files.